We use black pepper as one of the essential oils in our Muscle Rub, for its benefits for muscular aches and pains, arthritis and rheumatism. It can also be helpful when undertaking sport and sport training. The oil is made from the unripened fruits. It may be helpful for chilblains and bruises and anaemia. 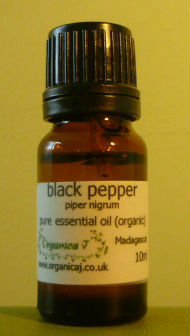 We have used black pepper in therapy too for digestive complaints, such as dyspepsia and flatulence.